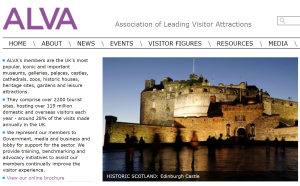 The Association of Leading Visitor Attractions (ALVA) visitor figures for 2017 always highlight the role of heritage in this key economic indicator, and saw an average increase in visitor numbers to UK attractions of 7.3%, while attractions in Scotland increased 13.9%, and in Northern Ireland 5.1%, though all the Top 10 most visited attractions were London based and the British Museum remained the most popular for the 11th year running. For the first time in 4 years, the most visited attractions outside London were in Scotland, where two attractions celebrated welcoming more than 2 million visitors. The National Museum of Scotland is the most visited attraction outside London – following the opening of ten new galleries in 2016 and moved to 11th place seeing 2,165,601 visitors and a 20% increase. The combined total for all 4 National Museums Scotland sites was 3,113,178. In 12th position was Edinburgh Castle with a 16% increase (2,063,709) – continuing to be the most visited paid for attraction in Scotland and seeing the combined total for the top 20 sites managed by HES (Historic Environment Scotland) being 4,464,126. For the 4 National Galleries Scotland sites visitor numbers were 2,564,726 with a 30% increase at Scottish National Gallery of Modern Art (Modern Two). Continuum Attractions’ Mary King’s Close on the Royal Mile had a record breaking 9% up on visitor numbers to 245,700. These increases were attributed to a boom in inbound and domestic tourism to Scotland. One of the largest increases was Inverewe Garden in Wester Ross which saw 109.6% increase – located on the popular North Coast 500 route, and with Inverewe House open to the public for the first time ever after a restoration project by the National Trust for Scotland, the famous gardens are enjoying a visitor boom. Other strong increases included Glasgow Cathedral (36%) Stirling Castle (18%), People’s Palace Glasgow (19.34%); Culzean Castle (11.6%), Crathes Castle (23.7%) and Culloden (27.6%). 64,137,632 people – just less than the total population of the UK – visited attractions in London and therefore it is no surprise that the Top 10 most visited attractions were all London based.